What are the different ways I can invest in Hughes Capital’s buy and hold fund? There are multiple ways to invest: 1031 Exchange, cash, IRA, or 401K. Regardless of how you invest, all investors receive the same benefits. We can walk you through whatever method you choose. How can I sell my investment property tax-free and use the sale proceeds to become an investor in the fund? We will help you set up a 1031 Exchange account so that you can sell your investment property tax-free, using the equity from the sale to fund your investment. As an investor in Hughes Capital’s buy and hold fund, you will enjoy diversification across hundreds of homes in the fund’s portfolio, with zero landlord hassles. How is it possible that 1031 Exchange investors are doubling their current investment income with Hughes Capital's buy and hold fund? This is because many real estate investors have built up equity in their property over the years and it is simply not being put to work for them. By investing in Hughes Capital’s buy and hold fund, every dollar of your equity will be working for you to produce greater investment income. We call this The Equity Edge. When I want to withdraw part or all of my money, how does that work? With a simple 90-day notice, our investors are able to withdraw their funds at any time, free of fees, penalties, or restrictions. Can I receive a monthly income from my investment? Yes, you may choose to take the monthly profit and have it automatically deposited to your account. You may also reinvest your monthly profits in the fund so they can compound. Why is having a consistent return so important? Volatility has a devastating effect on your portfolio. 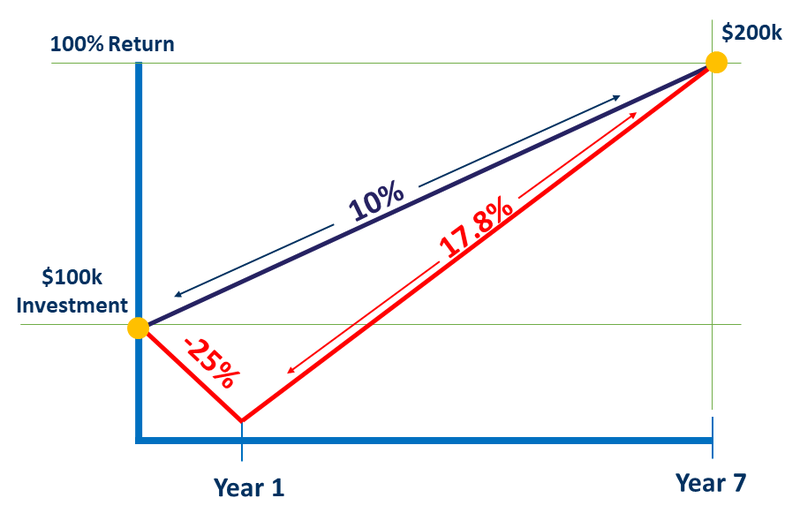 As this sample diagram shows, a consistent return of 10% for 7 years doubles your money. If there were a loss of 25% in the first year, it would take an astonishing 17.8% return for 6 years in a row to double your money. How often do you report to investors or send out statements? Every month, you will receive an Investor Update and Capital Statement. We believe strongly in communicating regularly with our investors, and we are always available to meet in person or take your calls. What makes the fund a 100% passive investment? There is nothing to “do” as a Hughes Capital investor other than read your monthly statement and receive your returns. This applies to investors entering the fund as former landlords through a 1031 Exchange, as well. As an investor in the fund, you’ll have absolutely no landlord hassles.